Ann Budd is an editor of Interweave Knits who has published a number of designs and several books focusing on knitwear design. So last month, when I started a sweater of my own design, I turned to my own library and the Internet for help with the trickiest parts - neck, shoulders, armscye, and sleeve cap. For me, the most difficult calculations are for the sleeve cap. 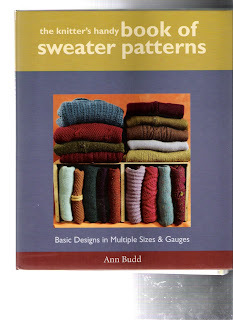 The Knitters Handy Book of Sweater Patterns by Ann Budd has a section on sweaters with set-in sleeves. But I found little guidance here on sweater design. Budd works with a variety of sweater styles such as drop shoulder, seamless yoke, or raglan; sets of sizes ranging from 26" to 54" inches around; and gauges from 3 to 7 stitches per inch. Within these parameters, you can fit your own sweater design, but you are bound to the conventions of fit and proportion established by the author. Each sweater type has a long series of charts that you can follow like a recipe to know how much to cast on, where to increase and decrease, when to bind off, etc. Here is a section of the chart for sleeves . You can see that you don't get the principles of design from this. No doubt you can knit a sweater, but you wouldn't understand how to draft the measurements that would fit the sweater together and to your body. 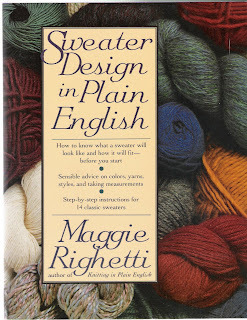 Sweater Design in Plain English was published in 1990. In it, Maggie Righetti uses examples and simple formulas to help you calculate the measurements you need to make your set in sleeves fit, as well as calculations for chest width, length, shoulder slope, neckline, etc. In short, everything you need to design a sweater to your own specifications. As given in her examples, Righetti's ideas of design and fit don't jibe with mine. Her design aesthetic seems dated. But that doesn't matter. With this book you get the tools you need to do it your own way. So I designed my armscye and sleeves based on Righetti's advice. I haven't finished the sweater yet. I'll let you know how it comes out. But along the way I found two incredible Internet resources. 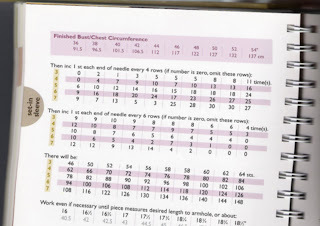 Lucia, the Knitting Fiend, on whom I have a knitter's crush, has made a sleeve cap calculator. Check it out. And while you are there check out the endless number of calculators, tips, techniques, patterns, and how to's that Lucia provides out of the kindness of her heart. The invaluable Jenna Wilson, through the wonder of Knitty, has also published a series called "Ravellings on the Knitted Sleeve" which includes a wonderful article on sleeve types, and a fabulous primer on creating a set in sleeve.